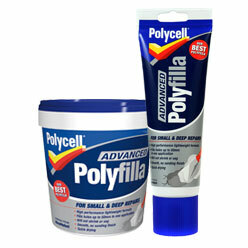 Polycell Advanced Polyfilla is a high performance lightweight filler for all general interior repairs. The quick drying formulation will not shrink or sag and has been specially developed to allow the filling of holes up to 50mm deep in one go. Its smooth texture means Polycell Advanced Polyfilla does not need to be sanded and will not show once painted. Ensure hole is free from loose material. Touch in nails and screws with a solvent-based paint. Stir into a smooth paste (if the filler is too dry, just add a few drops of water). Dampen hole slightly to improve adhesion of the filler. Press filler into hole with a filling knife, smoothing off with a wet filling knife. If required, wipe excess filler off with a damp cloth and leave to dry.